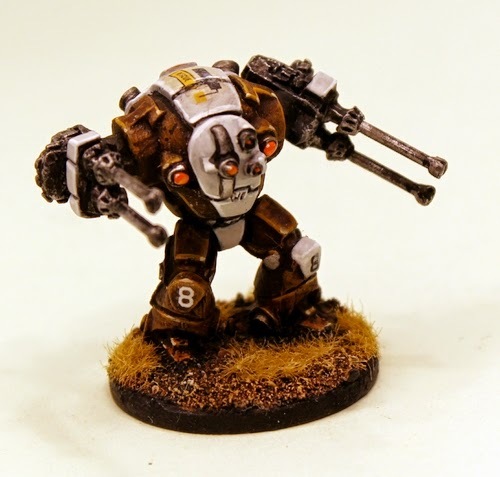 The Ion Age Blog: IAF072 Steornede Battlesuits Released! There was a smooth hum and vibration that began as Kimball pressed the start up sequence into the battlesuit's raised front plate. Transmission systems started up and the power core cycled at a low rate. One by one the displays on the inside of the front plate began to wink into life showing reds that flowed to amber and then into green ready status. Kimball settled himself into the padded pilots frame of the Steornede and placed his feet onto the grippers that quickly molded themselves to his bare flesh making themselves an extension of his legs. He reached out and flicked the primary switch that brought the front plate down. As it locked into place the titanium alloy clamps around the plate clunked home sealing it airtight and the displays were now at eye level. Each of Kimball's arms sat at his side with a control stick and buttons for the weapon systems in the arms of the battlesuit. He had been the pilot of PC119STR for two years but to him the machine was simply called 'Beth'. The real Beth had left him a year ago for a guy that worked for Maudlin in a high rise block in down town Pelcan City. More money but less fun. Still his Beth was purring now and would do as he told her. Around him the five other battlesuits in his platoon were showing ready status. He ran a check on the twin Moth 88 cannons which were his Steornede's primary weapons and they showed armed with twelve thousands case less rounds loaded. Kimball was ready. It would not be a long walk from the barracks to the combat zone. Not now. His Beth had been in action twice already against the aliens and the second time he had been lucky to get out alive. On the outskirts of the city they had been encircled as the barricades had fallen. He had been rescued with a magnetic lock from a dropped line that had lifted his Steornede up and out of harms way. Damn lucky that grav platform had seen him as it floated over, his ammunition was expended and Beth just could not run like those fancy Havelocks. This time the enemy was only a few streets away and Kimball doubted he would ever breath fresh air again so the smell of Beth would be last in his nostrils. He would die inside the battlesuit. He would die to give the people time to escape the city. Kimball wondered if the real Beth was still alive. Was she dead or had she got out already? Part of him really hoped she had. Using the platoon comm he signalled the order to move out. Up the ramp and into the street. His legs moved and the Steornede amplified it and stomped forward into a fight against an alien enemy that seemingly could not be stopped. I hope you liked the little extract from a future title here and welcome to our last releases for March 2015. 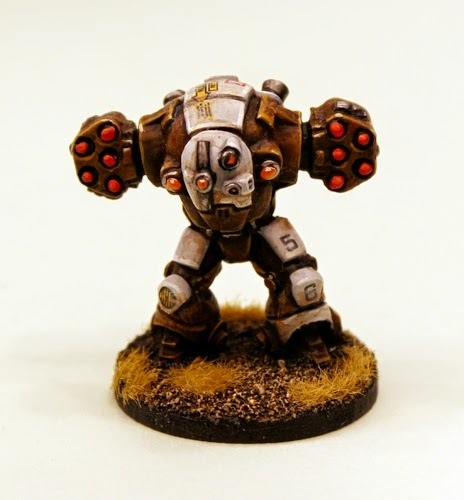 We are expanding the existing Planetary Militia range with two new battlesuits in 15mm scale. These new Steornede's fit exactly with the Planetary Militia platoon with unique miniature and with the vehicles too such as the Colabreta Carrier and the Hazelwurm Patrol Car. These are all great 15mm science fiction miniatures and all of us here at The Ion Age have been really pleased with the feedback not only from customers but also online to the first look at the Steornede's last week. Read on! The defence forces of the Prydian Precinct have their own battlesuit to put them on an equal footing with those who would invade or insurrection their homes. The Steornede is that battlesuit and this is the first variant made for short range anti-vehicle and artillery use. This code comprises a highly detailed 15mm scale miniature which is approx 30mm tall supplied as a one piece resin body and two separate white metal arms mounting Anda 60mm missile pods. Suitable for use in many different settings it is excellent back up for your infantry. As always this code can be bought as a pack or select the three packs and save 10% option on the page. Go HERE. Price 5.00GBP. The defence forces of the Prydian Precinct have their own battlesuit to put them on an equal footing with those who would invade or insurrection their homes. The Steornede is that battlesuit and this is the second variant made for short to medium range anti-infantry use. This code comprises a highly detailed 15mm scale miniature which is approx 30mm tall supplied as a one piece resin body and two separate white metal arms mounting twin barrel Moth 88 Cannons. Suitable for use in many different settings it is excellent back up for your infantry. As always this code can be bought as a pack or select the three packs and save 10% option on the page. Go HERE. Price 5.00GBP. Are you interested in the Planetary Militia range at The Ion Age? We have not managed all that we would have liked this month and I apologise for no news on Patrol Angis but we are nearly ready I promise! This is our last pair of releases for March 2015. I hope you like the two new Steornede Battlesuits and its a hybrid for us as its our only bi-pedal model this far to have a resin body and metal parts too. You also have until the end of the month to get the free miniature which is currently IMP19 Happy Burger Bot. You guys are loving this characterful robot. Thanks for your custom and for the kind words about our products we do appreciate it. We work hard and we want you all to have fun with your wargaming in our space opera setting. Finally remember that by placing an order with us you will sign up for an account with the website and that means you get Reward Points in all purchases and the free monthly miniature too. These points can be used any time to get free products and discounts on orders. Love these, do you do a flamer version? hmm, I wonder if the Steornede weapons will fit the Infernus as well? How does one pronounce Steornede? Stee-or-need? They can be made to fit yes. A little converting and they will mount in.